At 9 o'clock on Thursday May 4 2017, 25 young CBS hurlers set off with only one thing on their minds, and that was glory. Mr. Quinn and Mr. Hanley both took a team each for the tournament. The first teams group was Roscrea and the host Abbey CBS. In the first half against Roscrea they found themselves 9 points down at half time but from great efforts from Kian Dunne in the forwards and Eoghan O’Neill in the defence, to win by 2 points. The team showed great character which transferred to the next game in which they had a comprehensive victory against the hosts Abbey CBS. These two victories placed this CBS side into the cup semi-final against Middleton CBS who previously played the other CBS Kilkenny team. The second team's group was Middleton CBS and Our Lady’s Templemore. The first match was against Our Lady’s and it was a tightly fought match that went right down to the wire, and from great performances from the likes of Steven Doheny and Joe Healy, the CBS boys came out on top. Unfortunately the team fell short against a very strong Middleton CBS side, but the win against Our Lady’s was enough to progress them to a shield semi-final against Roscrea who previously played the other CBS Kilkenny team. Into the Shield semi-final the CBS team faced a Roscrea side that proved too strong for our boys, but they didn’t go out without a fight. Eugene Sinnott was very vocal in goal and Adam Harding gave the Roscrea backs a headache with his movement in front of the goal. The boys were very unlucky and distraught that they didn’t reach the final. In the cup semi-final the other CBS team faced Middleton CBS of Cork. It was a hard fought game as there was never more than two points between the two sides. From an outstanding performance from the likes of Cathal Norton and Matthew O’Sullivan the CBS Kilkenny boys came out on top by two points against a very potent Middleton side. The victory puts the CBS Kilkenny boys into the Cup final where they would face local rivals, Callan CBS. The final was a game that defined the strength and character of the CBS Kilkenny players. They were leaders stepping up all over the field, but none like the CBS Kilkenny captain Niall Holland. He was a vocal presence from the goal line and with a dominant puck of the sliotar reaching the full forward line, which caused problems for the Callan CBS backs. From the throw in, the match was filled with intensity. Callan led from the start with an early goal from star man Tom Brennan (Graigue-Ballycallan), but this did not worry the CBS Kilkenny who replied instantly with a point from Kian Dunne. It was point after point for both teams, but CBS Kilkenny managed to pull the game level on the stroke of half time with a well worked goal from Cathal Norton. The second half was an uphill battle for the James’ s street boys as they were playing against the wind, this really was the mother of all matches for the young hurlers. Callan shot two quick points putting them two points up with less than a minute gone in the second half. From here on in, it was a real team effort from the James’ street boys who somehow summoned two goals out of nowhere from star forward Cathal Norton and influential play from Sam Tynan. It was set for CBS Kilkenny to win only for Callan fought back hard to level the game, setting it up for extra-time. It was closely fought in extra-time but from performances from the likes of Joshua Nolan and Ben Tennyson sniffing out any attack from the Callan forwards. The final whistle blew and CBS Kilkenny were crowned Rice Cup ‘B’ Champions for 2017. Cup Final team: Niall Holland (c), Ben Tennyson, Eoghan O’Neill, Kian Dunne, Cathal Norton, Joshua Nolan, Sam Tynan, John O’Brien, Geroid Kent, Nathan Murray, Luca Loli, Matthew O’Sullivan, Vinny Roberts (inj), Alex Molloy (inj). Shield Semi-Final team: Eugene Sinnott (c), Steven Doheny, Evan Buggy, Josh Culleton, Paddy Collins, Tony Collins, Joe Healy, Cillian Norton, Paddy Kehoe, Evan Dowling, Jack Kelly, Eamon O’Reilly, Adam Harding. There are two juvenile grades to play for in the Kilkenny CBS. There is the Rice Cup panel which is the U14 age group and the U141/2 panel. 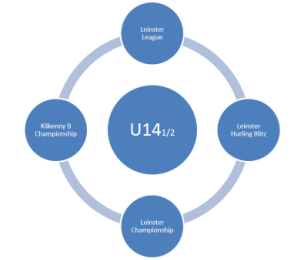 ​Here is a timeline for Juvenile Hurling in the CBS (those marked in red are unique to CBS schools). 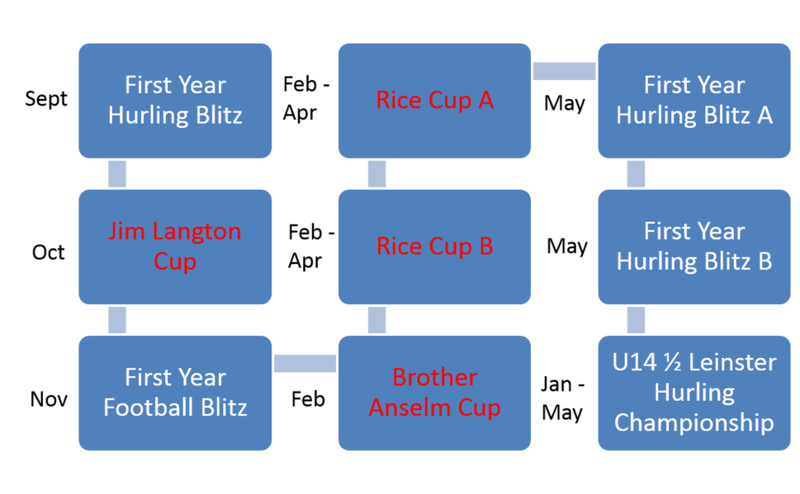 We compete for three major trophies every year at the U14 grade: the Jim Langton Cup, the Brother Anselm Tournament and the Rice Cup. 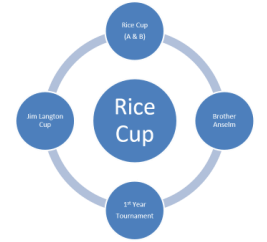 We have had recent success in the Jim Langton and Brother Anselm Tournaments, but the Rice Cup has eluded us of late, However it is one of our major ambitions to win it in the not to distance future. Also we compete for a number of blitzes throughout the year, most notably the annual 1st Year blitz where schools from all over Leinster compete near the end of the school year. Our U141/2 team competes for the Leinster league and championship every year. In the last two years we have reached two Leinster hurling championship finals. Our U141/2 panel trains every Wednesday in preparation for the league and championship which begins in February. 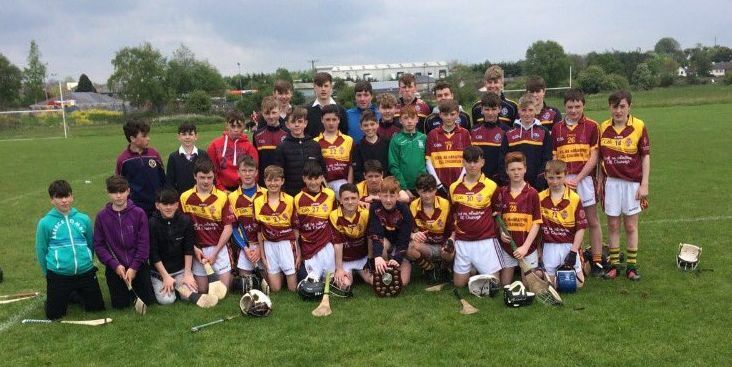 ​We also compete in a Kilkenny Hurling Championship which gives our players a chance to play competitive hurling against local schools like St. Kierans’s College, Castlecomer Community School and Callan CBS.